Work by Terri Weifenbach on view Friday at Civilian Art Projects. Image courtesy Civilian Art Projects. Adam Dwight & Dana Jeri Maier: Off in a Corner: at Flashpoint Gallery: The two sets of work now on view at Flashpoint purport to share the theme of “issues of drinking and adulthood.” But a more compelling lens through which to view them is the artists’ approach to the subconscious — all of the works blur the line between highly planned dreamscapes and automatic drawing. Maier’s hundreds of bar coaster doodles depict impossible, biomorphic constructions and sometimes sad, sometimes whimsical portraits. Dwight’s nightmarish paintings and installations delve into the biography of MADD founder Candy Lightner. On view until May 7. Discussion panel on April 21 at 6:30 p.m. followed by a “Drink ‘n Draw,” in which attendees are invited to nearby bars with the artists, who will create new drawings to be distributed. FREE. Metro: Gallery Place-Chinatown. “Philip Guston: A Life Lived” at the Phillips Collection: This hour-long documentary, filmed in 1980 during Guston’s final retrospective, tracks the painter’s progression from his early experimentation to Abstract Expressionism to the cartoonish figuration that would come to be his signature style. Guston, who died shortly after filming, narrates the film and is seen painting in his Woodstock studio. Included in admission to special exhibitions and free for members. April 21 at 6:30 p.m. Metro: Dupont Circle. 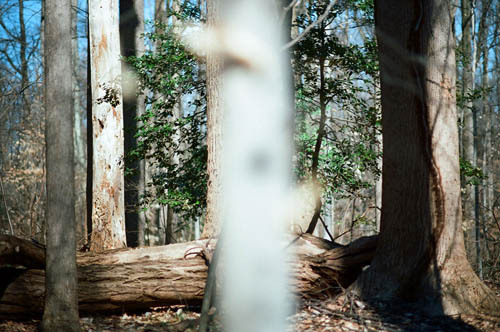 Woods II: New Work by Terri Weifenbach at Civilian Art Projects: For her second solo show at the gallery, Civilian Art Projects will display 21 of Weifenbach’s photographs depicting woods in or around D.C. Originally trained as a painter, the artist combines the technical knowledge of both mediums to capture and rework moments in nature that seem at once spontaneous and highly planned. On view April 22 to June 4. Opening reception on April 22 from 7 to 9 p.m. FREE. Metro: Mt Vernon Square-Convention Center. Green Works Closing Party and Earth Day Event at Project 4 Gallery: To wrap up their exhibition of environmentally conscious installation art, Project 4 is hosting an Earth Day party this Friday evening. A panel of “local green experts,” including Carlos Amaya, chef and owner of Coppi’s Organic Restaurant, will discuss eco-friendly living, and attendees will have a chance to view the show and sample Earth Day cupcakes from Sprinkles. Make sure to catch Heidi Fowler’s bottle-cap designs and Julia Anne Goodman’s handmade papers with poppy seeds and lilac. April 22 from 6:30 to 9:30 p.m. FREE. Metro: U Street-Cardozo. NEXT at the Corcoran: BFA Class of 2011 at the Corcoran Gallery of Art: The Corcoran takes advantage of a temporarily lull in special exhibitions to open its undergraduate thesis show, featuring recent work by seniors in fine art, photography and design. Watch a video of students preparing for the show here. On view April 23 to May 22. Opening reception on April 23 from 6 to 8 p.m. FREE. Metro: Farragut West or Farragut North.